See the glass half full, find the silver lining, look on the bright side…there are endless platitudes and clichés that are so regularly recited, they don’t seem to carry much meaning. This seems especially true on the days when metaphorical rain pours down on your metaphorical parade, or when a storm cloud seems to be hovering over your head for days on end. But taking a closer look at optimism reveals these everyday turn of phrases actually have the right idea in mind. When put into routine practice, positive thinking can change your whole life for the better…and in more ways than one. Now, this may run the risk of sounding pessimistic, but of course, there is a slight catch. Becoming a positive thinker isn’t as simple as looking at a colorful “Keep Calm and Carry On” poster more often. “It’s easier said than done,” says Noelle Damon, a holistic psychotherapist. “It takes practice. Positive thinking is not to be confused with a belief that everything is OK or should be OK. It’s about maintaining balance even when it isn’t.” Now for the good news: Once you equip yourself with the proper tools to transform negative thoughts into positive ones, you’ll begin to notice a change, not only in yourself, but in other aspects of your life from relationships to even your physical appearance. “Positive thinking absolutely affects your mental health,” says Dr. Chloe Carmichael, who holds a PhD in clinical psychology. “Depression and anxiety have been directly linked to negative thoughts, so it is definitely in your best interests to focus on the bright side.” Changing your outlook can eventually revamp your attitude long term. Automatic positive thoughts allow for a mental foundation that puts your mind at ease. This in turn makes you better equipped to make difficult decisions and helps you to stop second-guessing yourself. With clear goals and less-clouded judgment, your motivation and desire to reach such goals will be increased since you will see them as attainable. 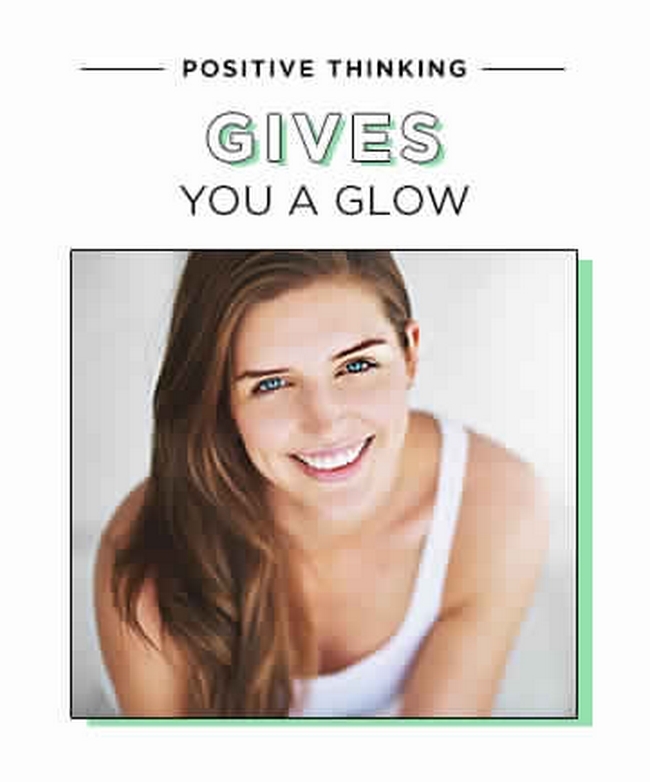 In addition to helping your body on the inside, positive thinking can work wonders on your outer appearance too. “Focusing on negative things increases the cortisol levels in the body which is a stress hormone — and we all know that people who are stressed don’t tend to have that radiant, healthy glow,” says Carmichael. Unmanaged stress may not be the root of skin problems, but it tends to be a trigger factor for pre-existing conditions such as acne and eczema. A simple smile (which already works to brighten your appearance) can quickly put you on the path of positive thinking. This, in turn, will keep those stress levels in check and help keep your skin clear. “Research shows that maintaining a pleasant, happy expression actually lifts your mood because you interpret it as a sign of happiness,” says Carmichael, and a better mood translates into a healthier look. In addition to mending your self-esteem and boosting self-confidence, positive thinking will eventually radiate out towards those around you. 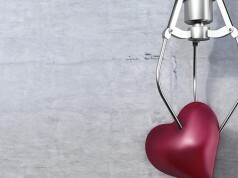 “The form of mindfulness that springs from positive thinking can help you develop compassion — not only toward yourself, but toward others,” Damon explains. 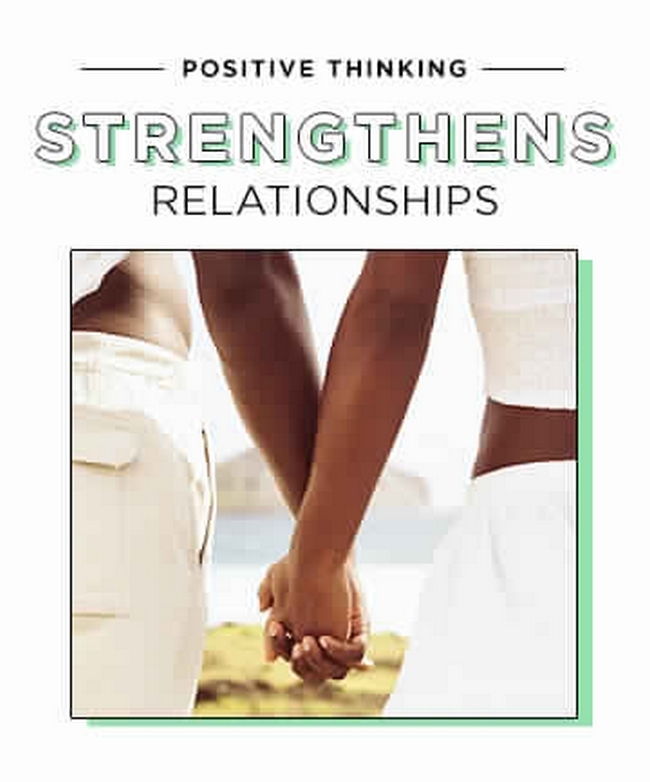 “This can lead to increased understanding, kindness, and cooperation,” all of which will help you build and foster the many relationships in your life, from family, significant others, and coworkers you see on a daily basis. Furthermore, having a positive attitude will increase your relationship satisfaction and attract positive people. 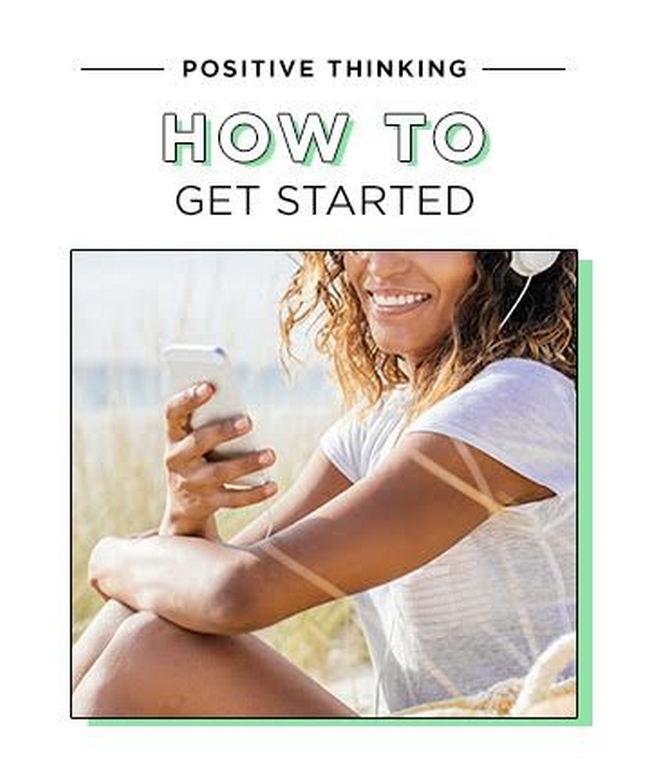 To reap the benefits of positive thinking, Tessina, Carmichael, and Damon recommend implementing these simple changes into your daily routine to slowly shift your mindset. Take note: Write positive comments on your daily calendar for any achievements you want to celebrate or any instances that made you feel good (i.e. feeling proud because you went to the gym, your boss gave you positive feedback, you received a compliment from friend). Engage yourself : Actively take part in things that make you happy, even if you need to schedule it into your daily schedule. Catch up with an old friend, listen to your favorite songs, paint, read, or pick up tickets to a sporting event. Picture it : Surround yourself with visible evidence of your successes. Display photos of fun events, sports trophies, articles you’ve published, etc. It’s a constant reminder that you appreciate yourself and when you see them daily, you’ll feel the appreciation. Find a place: Develop a peaceful place inside yourself that you can “visit” whenever you are not at ease. Think about a place, real or imagined, that evokes a feeling of calm. Close your eyes and totally immerse yourself in the experience of that place. Practice going here in your imagination frequently so you can call upon it any time, particularly when you are stressed.